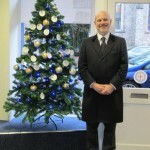 Every year, Lodge Brothers Funeral Directors place a ‘Memorial Tree’ in each of their branches. Families who have lost a loved one in the past year are invited to write a message on a card to them and hang it on the tree in memory. At Chertsey, Branch Arranger Helen Kempster and District Manager Richard Leachman (pictured) invited the local vicar to host a short service of blessing at the branch. Over a dozen recently bereaved clients joined in with the service, led by Rev Tim Hillier of St Peter’s Church. Helen and Richard then served refreshments. “It may be low-key, but the Remembrance Tree and today’s service is very meaningful to those of us who have gathered together,” Richard commented. “Each tag represents a loved one remembered at this special time of year”.